We sat around the table reminiscing. We told stories of games we played when we were kids. We brought up embarrassing things we did as kids. We discussed our shared memories. We laughed, we loved. We road tripped it to one of my favorite places on earth this past weekend. We packed up the car and headed to Pittsburgh. Yes, Pittsburgh, PA is one of my favorite places. It's the San Fransisco of the Midwest. It's a mix of New York/Philly tossed with small town middle Americana. It's all cool old buildings and new construction. It's pop culture meets blue collar. It's All the Right Moves and Flashdance. It's the comeback from depression/recession that Detroit wants to be. It's the town where I lived after college and fell in love with my husband. It's the town where my father has lived for the past 20 years. It's the town my brother moved back to a few years ago. It's home base for my extended family and me. 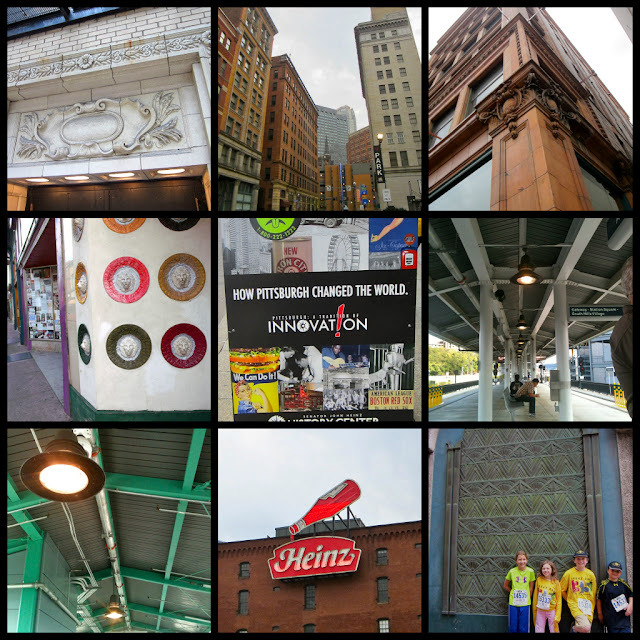 Every September, we gather together in Pittsburgh to run the Great Race. My clan travels from Detroit and my sister's group travels from Kentucky. 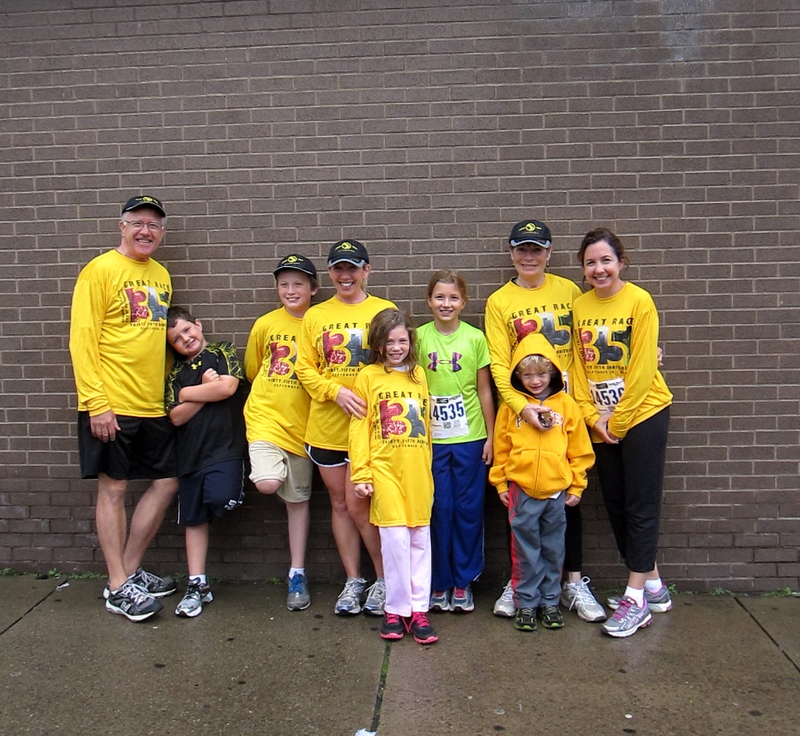 The 5-K race is a tradition we started four years ago for my dad's 60th birthday. In celebration of life, health and the town we call home base, we run the race. Every year, we run the 3.2 miles through our beloved city. It started with my sister, my dad, his wife and me. Since that first year we continue to add children that are eager to be included. And even some that aren't. This year Lucy said she wanted to run it, but she lied. We were no less than 20 steps into the race when she said she had a cramp. Ugh. I tried encouragement--"you can do this, you are amazing, look at that stride, you're a natural." I tried competition (or what you might call 'egging on')-- "if you run faster, you might beat your brother, c'mon wouldn't that be great to beat your big brother?" I tried shaming--"is something wrong with your legs? why are you moving so slowly? I'd like to finish the race before noon for Christ's sake." Nothing worked. Lucy was adamantly, positively most certainly pissed. Delays were likely. Despite my annoyance at our hideously slow times being announced by diligent volunteers at the mile markers, Lucy and I finally managed to enjoy ourselves. The others raced ahead. Lucy and I held hands (walk or run) for exactly 3.2 miles. We talked about living in cities, clothes, colleges, vacations and more. We were developing a shared memory. Years from now hopefully my kids will run a race and devour pancakes at the local hot spot afterward. My brother meets us for the traditional breakfast, but has yet to be inspired to run with us. Years from now my kids will talk about their childhood. My goal is to have the happy outweigh the bad. My goal is to have special moments and memories overload them. My goal is to make sure my kids know they are loved and safe. I'm a big believer in the fact that shared experiences, shared moments, shared memories help those goals. No matter how fast or slow you run. This weekend was full of shared memories and just plain good, healthy fun company. So fun that we are just plain exhausted.